The world is becoming a giant computer comprised of data centers, networks and devices on the fringe, but that’s not good enough. With massive amounts of untapped data and cloud computers still running on desktop processors, there are opportunities to change the computing model. Doing so will bring a collection of immersive services to the world’s population while using less energy at the same time. There’s much work to be done before this future arrives, however. “Energy efficiency and cost is driving everything we do in cloud computing,” said Partha Ranganathan, distinguished technologist for HP (s hpq). 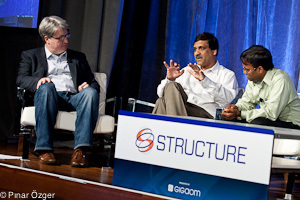 Speaking on a panel at the GigaOM Structure conference, Ranganathan pointed to the massive potential yet to be found in the cloud through low-powered devices. “Today’s cellphones have as much computing power as NASA had in the 1960’s. They launched a rocket to the moon and we’re launching pigs and birds,” he said, referring to the popular Angry Birds game. Anant Agarwal, co-founder and CTO of Tilera Corporation agreed. “Datacenters use hundreds of megawatts of power because they’re build upon desktop processors. We can do 100 times better with specific cloud processors that have many cores in a chip but don’t have other features not needed for cloud computing.” Agarwal suggested that processors are still the bottleneck in cloud services because bandwidth is plentiful and fast while memristors are providing cheaper, non-volatile memory. But there’s still an issue of software, according to Jason Hoffman, founder and chief scientist of Joyent. “Software is a million times worse than it needs to be,” Hoffman said, mainly because there’s no software platform for the cloud itself. Agarwal suggests an OSaaS or Operating System as a Service to address this issue. “Operating systems today are really good for a single computer,” he said. “Cloud apps require systems programmers, however, to deal with load balancing, databases and more.” And as computing has come down in price, it has “allowed software to be sloppy,” said Agarwal. What will overcoming of these challenges bring? The panelists used the example of how today’s high-end luxury cars examine hundreds of data points to determine if the driver is falling asleep. Scaling such computation to the “world as a giant computer” will lead to new interactions with computers, services and even people. Instead of using the cloud for simple voice searches as we do today on smartphones, tomorrow’s cloud will be able to interpret our gestures, expressions and even our current health stats. That sounds great, but if it doesn’t pan out, we can always use a cheap desktop with an sensor-filled Kinect.